For the 9th consecutive year, Plunkett Cooney, one of the Midwest’s oldest and largest law firms, has been ranked as one of the “Best Law Firms” in the nation by U.S. News and Best Lawyers® for 2019. Four of the firm’s offices received tier-one ratings in multiple practice areas. Receiving a tier designation reflects the high level of respect a firm has earned among other leading lawyers and clients in the same communities and the same practice areas for its scope of practice, understanding of business and needs, expertise, responsiveness, integrity, cost-effectiveness, civility and client reference. 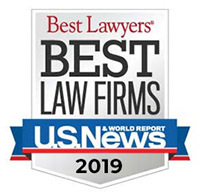 “Best Law Firms” rankings are based on a combination of law firm leader and client feedback, independent research, and responses gathered from Best Lawyers peer-reviews. To be eligible for a ranking, a law firm must have at least one lawyer who has received high enough peer-review to be listed in the current edition of Best Lawyers. Firms are eligible in the practice area(s) and metro region(s) in which they have listed lawyers. Best Lawyers is the oldest and most respected attorney ranking service in the world. For more than 30 years, the Best Lawyers in America list recognizes the top lawyers in each practice area and metropolitan region in the country. U.S. News & World Report is a multi-platform publisher of news and information. For more information about Plunkett Cooney’s recognition as a 2019 “Best Law Firm,” contact the firm’s Director of Marketing and Business Development John Cornwell at (248) 901-4008; jcornwell@plunkettcooney.com.